One of the world's most essential seasonings and preservatives, salt is a chemical compound technically referred to as sodium chloride. Salt is, in fact, the only rock that we humans eat. It can be mined from the ground or harvested from the sea, but most of today's salt comes from large deposits left behind by dried salt lakes. In addition to enhancing the flavor of foods, salt is used to cure meats, can or pickle vegetables, soften water, clean up household messes and much more. Salt is available in a wide variety of types that differ in their texture or grain, and purpose. Mainly used in cooking and as a table condiment, this fine-grained, refined salt has additives to make it free-flowing. Iodized salt is a table salt with added iodine. This coarse-grained salt is additive-free and often preferred by gourmet cooks for its texture and flavor. It's often used in preparing meats and liquid-based foods such as soups, sauces and stocks. Derived from evaporated sea water, this salt has a fresh, distinct flavor. A favorite of culinary experts, it's available in fine or coarse grinds. Celtic salt is a natural, solar-evaporated sea salt that's hand-harvested from marshes in Brittany, France using a 2,000-year-old Celtic tradition. It has a mellow, sweet-salty flavor. Not highly refined, this grayish salt retains more minerals and comes in chunky crystals. It's used as a bed for oysters and clams and to make ice cream. This fine-grained, additive-free salt is used to make brines for pickles and sauerkraut. Also called citric salt, it's extract from acidic fruits like lemons and limes. It adds tartness to traditional dishes like borscht. This is regular salt combined with other flavorings. Examples include onion salt, garlic salt, celery salt and seasoned salt (a blend of salt, herbs and spices). Salt will last indefinitely if stored in an airtight container. It may clump when exposed to humidity, but will separate easily when smashed with a spoon or rubbed between your fingers. Keep salt out on the countertop in a container that lets you grab a pinch or dip in a measuring spoon. Try an open-shaped "salt pig" container designed to keep out humidity. Add a few rice grains to your salt shaker to keep it pouring freely. 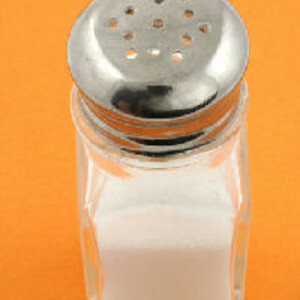 To prevent oversalting, season dishes at the end of cooking or preparation time.